This recipe for Slovak stuffed cabbage, also known as holubky or halupki, is made with ground beef and pork, sauerkraut, paprika, and tomato sauce. It's a traditional comfort-food dish that is cooked slowly on the stovetop and goes well with rye bread and butter. Remove large outer leaves from cabbage and set aside. Remove core from cabbage. Place whole head in a large pot filled with boiling salted water. Cover and cook three minutes or until softened enough to pull off individual leaves. You will need 18 leaves. Chop the remaining cabbage, still reserving large outer leaves, and place it in the bottom of a large greased casserole dish or Dutch oven. Rinse rice and cook it in 1/2 cup water until water is absorbed. Remove from heat and let cool. Meanwhile, sauté chopped onion in butter in a medium skillet until tender and let cool. In a large bowl, mix cooked and cooled rice, cooled onions, beef, pork, salt and pepper to taste, egg, garlic, paprika, reserved sauerkraut juices, and 1/3 cup of the tomato sauce; blend ingredients thoroughly. Don't overmix or the meat will become tough. Place about 1/2 cup of meat on each cabbage leaf. Roll away from you to encase the meat. Flip the right side of the leaf to the middle, then flip the left side. You will have something that looks like an envelope. Once again, roll away from you to create a neat little roll. 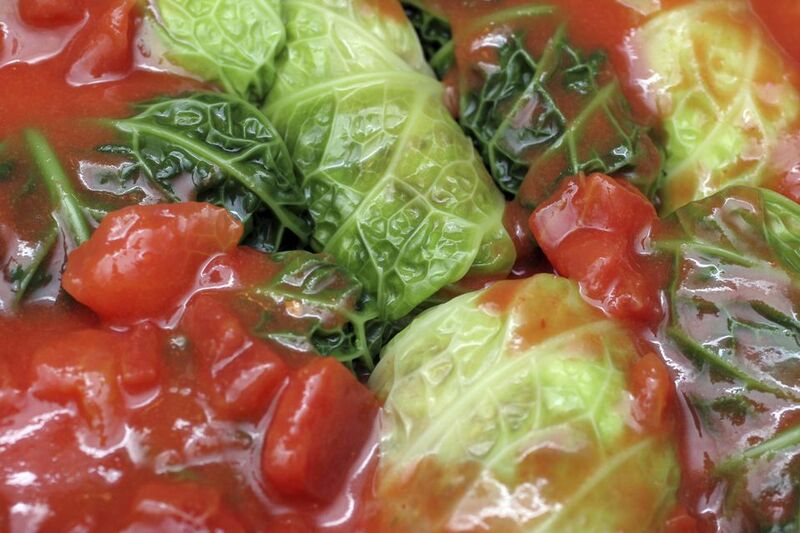 Place the cabbage rolls on top of the chopped cabbage with sauerkraut and some tomato sauce in between the layers in the casserole dish or Dutch oven. Top with all the crushed tomatoes, remaining sauerkraut and tomato sauce, and a few of the reserved whole cabbage leaves. Add enough water to cover completely. Bring to a boil, reduce heat to very low, cover and simmer three to four hours. Watch carefully so stuffed cabbages don't burn. Serve with pan juices and a drizzle of sour cream, if desired, mashed potatoes, and crusty bread. Cabbage rolls freeze well before or after cooking and can be made in a slow cooker (see your manufacturer's instructions).